Not all IP is created equal, and not all of it will work in automotive designs. Falling automotive electronics prices, propelled by advances in chip manufacturing and innovations on the design side, are driving a whole new level of demand across the automotive industry. Innovations that were introduced at the luxury end of the car market over the past couple years already are being implemented in more standard vehicles. 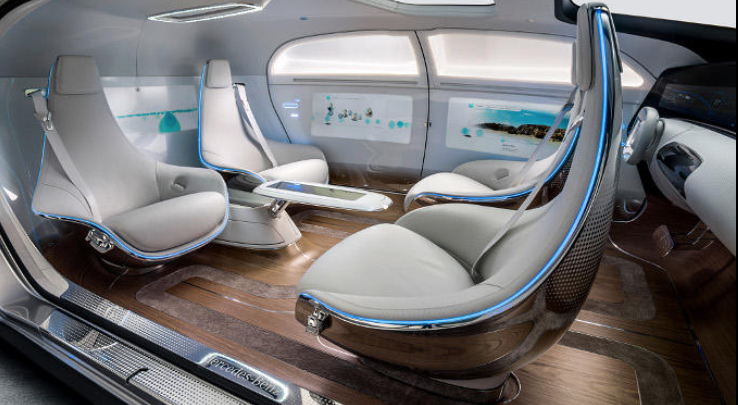 The single biggest driver of change in the automotive sectors is electronics, and that trend is expected to continue for the foreseeable future as carmakers push into ever-greater levels of assisted and autonomous driving. “As more and more affordable electronic equipment trickles down into entry-level vehicles, it is fueling an increase in the demand for in-car electronic devices for numerous applications such as entertainment, navigation, the monitoring of a number of conditions, and for accident prevention,” said Ranjit Adhikary, vice president of marketing at ClioSoft. The fastest way to build chips for this market is to leverage what already has been created for other chips. But IP used in automotive applications is totally different from consumer applications. It has to function under harsh operating conditions with an expected lifespan of 10 to 15 years. Moreover, IP in vehicles has to adhere to a set of stringent but still evolving regulations, such as the Functional Safety for Automotive standards as defined by ISO 26262. Until recently, third-party IP was chosen purely on the basis of function and power/performance characteristics, regardless of what market segment it was used in. Times have changed. 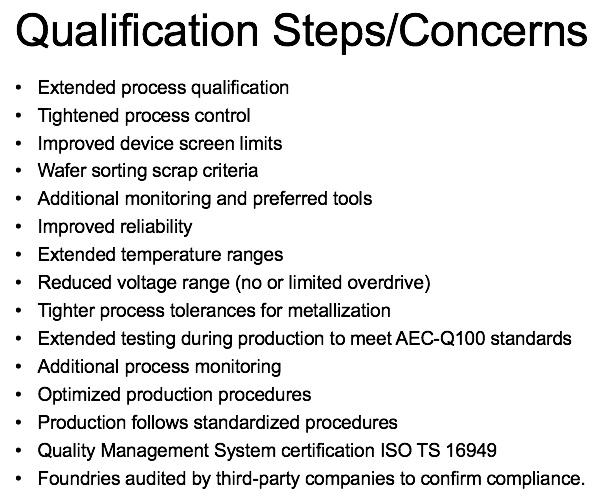 The automotive industry now has multiple standards for automotive IP, and the standards are being updated regularly. Within the car, there are multiple applications and domains, and each is addressed by different chips, as well as the IP that goes in those chips. These typically fall into three categories of chips. ADAS processors also require safety-critical features, and therefore the IP building blocks of ADAS chips need to be compliant with the automotive functional safety standard ISO 26262. Further, even in infotainment applications, long-term reliability is critical. “Those chips need to operate with a 10 to 15 year lifetime, and from an IP perspective, that needs to meet the characteristic of long-term reliability especially when it comes to electromigration: you don’t want a fault to develop based on electromigration failure, which could be very typical in a commercial chip that is force fit into an automotive application. Therefore, the IP must be designed to prevent that, and handle long term reliability requirements such as electromigration,” DiGiuseppe added. The IP also has to be general enough to be re-used across a variety of applications within a car, and specific enough to do exactly what is necessary. As can be the case with hot and emerging market opportunities, not everything is up to spec, and companies that are new to the industry are struggling to develop chips that meet specs. Not all of them are succeeding, according to industry sources. But commercially available IP may provide some help. At the very foundation of SoC design today is the data and support that comes from the semiconductor manufacturers themselves. For this reason, relationships between foundries and the entire semiconductor ecosystem have never been tighter. 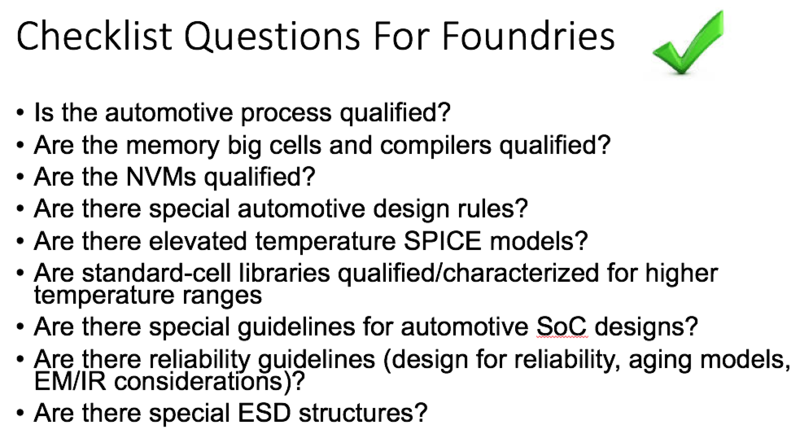 In order to support automotive SoCs, foundries deploy a range of different processes and geometries to support the diversity of automotive applications, Cadence’s Wong said. Automotive ICs are manufactured in bulk CMOS, including high-K/metal gate and finFETs for more advanced nodes, as well as with fully and partially depleted SOI and bipolar-CMOS-DMOS processes. Designs in bulk CMOS can range from 1µm to 250nm/180nm, all the way down to 16/14nm. PD-SOI hovers around the 180nm to 90nm range, and FD-SOI hovers around 28nm to the recently introduced 22nm. On advanced nodes in bulk CMOS, chips are being developed at 65nm, 40nm and 28nm being, with newer applications using 16/14nm. There is even discussion about moving some of the advanced ADAS chips to 10/7nm. The challenge is mixing long-term reliability and stringent temperature requirements with brand new leading-edge processes. ISO 26262 mandates what is referred to as the State of the Art (SOA) process methodology. Specialty analog foundry TowerJazz serves the automotive market by adapting its foundry technologies for automotive customer needs, explained Amol Kalburge, senior director of strategic marketing for the RF business unit at TowerJazz. “For example, our silicon germanium and mixed-signal/power management technologies that are used in high volume for consumer applications such as smartphones, or tablets are also offered for automotive.” To date, the company has shipped over 500 million ICs to automotive customers. Engineering teams targeting automotive applications have new challenges just because they may not have designed for this market segment previously. It is still SoC design, and the IP is not so different. And at least for now, automotive requirements are agnostic to process node. But complexity is rising even at older nodes.